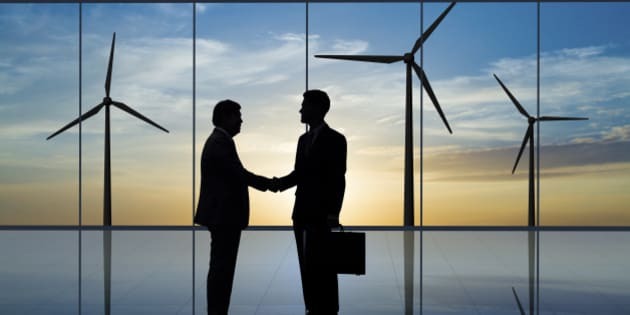 CALGARY - Enbridge Inc.has announced a deal to invest US$200 million in a 110-megawatt wind project in Texas. The Keechi Wind Project is being built with Renewable Energy Systems Americas Inc., a Colorado-based firm that has worked with Enbridge on three other wind projects. Construction for Keechi Wind began last month and is expected to reach completion in early 2015. Power from Keechi Wind will be fed into the Electric Reliability Council of Texas under a 20-year power purchase agreement with Microsoft Corp.
"As the nation's leader in wind energy — both in installed capacity and number of turbines — Texas represents a natural extension for Enbridge's growing U.S. renewable energy portfolio," said Don Thompson, Enbridge's vice president of green power and transmission. With the latest investment, Enbridge — which has also invested in geothermal and solar projects — has more than 1,800 megawatts of green electricity capacity in its portfolio. That's enough to supply more than 590,000 homes. Enbridge, better known as a major North American crude oil shipper, says it has made a "neutral footprint" commitment to generate a kilowatt of renewable energy for every kilowatt of conventional electricity its liquids pipeline operations consume. Its shares fell about one per cent, or 50 cents, to $45.59 Monday on the Toronto Stock Exchange. Last week, another major Canadian pipeline giant, TransCanada Corp. (TSX:TRP) acquired the Mississippi Mills solar project in eastern Ontario.